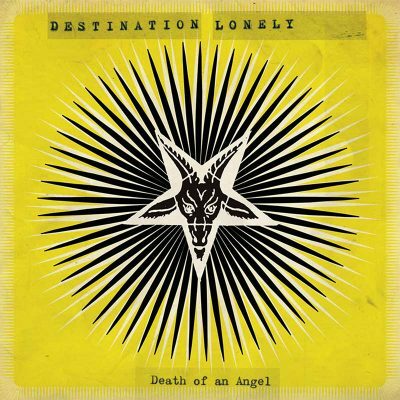 Destination Lonely’s Death Of An Angel is swampy garage punk at its boggiest. Hailing from Toulouse/Bordeaux, this group delivers sounds infused with heavy guitar distortions and groove moods. It’s a style that’s been heard before, but not with this group’s approach. This is not surprising, given that this album is named after the Donald Woods & Vel-Aires soulful 1955 track of the same name. The opening track, “Dirt Preacher,” is a cover by the 1980s Memphis-based rockabilly outfit, The Gibson Bros. It’s a sort of chaotic, bluesy, psych-punk tune from the inner depths of the smoke-filled garage. Its swirling distortion effects are enough to make the head spin—given the right additives. Listening to this sober might invite headache or bits of enlightenment. Tracks like “Staying Underground” and “I Don’t” show off this band’s defiant attitude. It’s a kind of wild side that is charismatic and reckless. Sliding, razor-sharp riffs define “Staying Underground,” while a prominent back-beat kicks in for “I Don’t.” This is the kind of music that was meant to be played while kicking in walls or television sets. The beauty in this album comes from Destination Lonely’s combination of desperate vocals with the hybrid of psychedelic garage rock. This is particularly evident in their Donald Woods & Vel-Aires cover. Like the original, it’s soulful. However, with Destination Lonely’s take, it’s got a slight up-tempo rock n’ roll beat to it. Overall, it’s a wonderful homage piece. “Vanessa” is another song that follows in the same vein of Destination Lonely’s cover of “Death Of An Angel.” It’s a pleasant tune to sway and daydream to. This track is a mid-tempo mover that’s got a slight, fuzzed-out, desert-psychedelic effect to it, and the vocals sung in French. In contrast, “Straight From Hell” has some teenage yet soothing poppy angst to it. It’s a style that kind of reminds me of French garage rockers The Madcaps. “Outreau” has a devastating industrial feel. Like the opening numbers, it’s overwhelming and brings on a certain sense of dread. This track reminds me of the power behind Salt Lake’s own Brain Bagz’s heavily distorted garage punk—although Destination Lonely’s is a more polished take.